After making a bargello quilt, I decided the pattern would work well on trays. 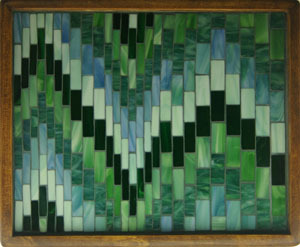 It took a little figuring as there are not as many options in glass colours as fabric patterns but in the end it worked. I have tried a using different colours and widths of glass. This design could be a custom order to go with a special quilt or room design. It to 195 individual pieces of glass .